A close encounter with Comet Siding Spring (C/2013 A1) in October of 2014 has now shown that Mars magnetic field was thrown into an uproar. Even though most of the sensitive equipment on NASA’s Mars Atmosphere and Volatile Evolution (MAVEN) spacecraft had to be powered-down before the comet’s arrival to protect it, MAVEN’s magnetometer remained on. And it’s a good thing too, as it continued to conduct observations from a front-row seat during the comet’s remarkably close flyby. This rare event gave scientists a perfect view of the havoc wreaked on Mars magnetic environment (magnetosphere) as the comet zipped by. . The effect was temporary but profound. The picture above depicts an artists rendition of the close encounter between Comet Siding Spring and Mars which flooded the planet with an invisible tide of charged particles from the comet’s coma. The dense inner coma almost reached the surface of the planet. The comet’s powerful magnetic field then temporarily merged with, and overwhelmed, the planet’s weak field. To further explain the incident, Mars simply doesn’t have a strong magnetosphere, so when the comet came in close contact with the dusty world, it redirected the solar wind around the planet (like a rock diverting the flow of water in a creek). This is due to the fact that Mars’ atmosphere is made up of plasma and a layer of electrically charged particles and gas molecules. Once these charged particles in the solar wind interact with this plasma, they move around to create currents, which in turn induce a magnetic field. 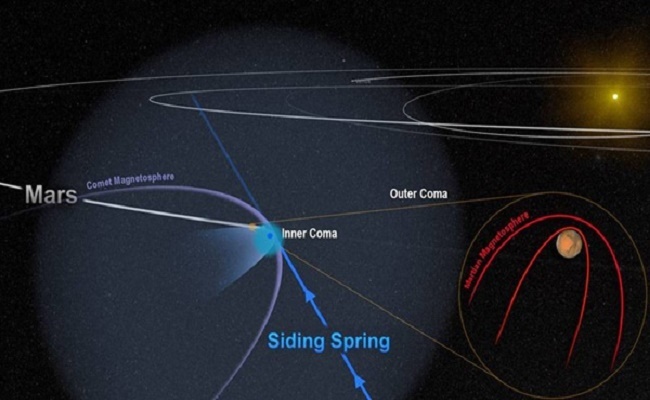 Although Comet Siding Spring has a nucleus that is relatively small (1/3 mile or 0.5 kilometers) the comet itself is expansive stretching out 600,000 miles (1,000,000 kilometers) in every direction. It is also surrounded by a magnetic field which is what caused all the chaos on Mars. Comet Siding Spring passing by Mars. Photo courtesy of NASA. 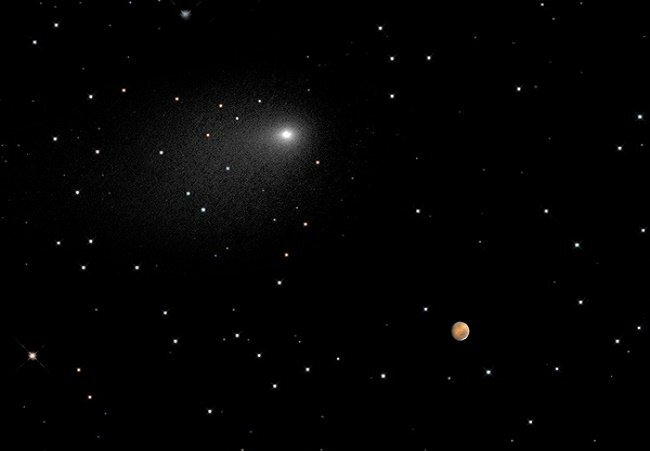 When Comet Siding Spring passed Mars, the two celestial bodies came within about 87,000 miles (140,000 kilometers) of each other. The comet’s coma covered the planet for several hours, with the dense inner coma nearly reaching the surface. This caused Mars to be flooded with an invisible tide of charged particles from the coma, and the powerful magnetic field around the comet temporarily merged with and overwhelmed the planet’s own weak one. Mars was indeed feeling the first effects of Comet Siding Spring which showed some regions of the magnetosphere beginning to realign and point in different directions. As the comet grew closer to Mars these effects built in intensity, almost making the planet’s magnetic field flap like a flag in the wind. By the time the comet was at its closest and its plasma was the densest, Mars’ magnetic field was in a complete and utter uproar. Even hours after the comet’s departure, some disruption continued to be measured. All this chaos led researchers to theorize that perhaps the effects of the plasma tide were similar to those of a strong but short-lived solar storm. And like a solar storm, the comet’s close passage likely fueled a temporary surge in the amount of gas escaping from Mars’ upper atmosphere. Over time, those storms took their toll on the atmosphere. Mars is definitely a planet with many mysteries yet to be discovered. Stay tuned for more fascinating and mind-blowing facts. Name a star now! - Comet Flyby Has Mars in an Uproar!